Hargett is Hole In One International’s latest Million Dollar Shoot-out winner from Provo, UT who ended up acing a 150-yard hole with his nine iron at the Mark Eaton Celebrity Classic. The tournament took place at Red Ledges Golf Course in Heber City, Utah back in September of 2009. Funnily enough, Hargett was somewhat reluctant to become a last-minute replacement in the tournament, as he suffered from a sore wrist. He aced the hole using a borrowed club from his brother… and then fell down as he charged the hole after the shot! 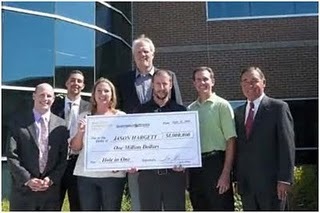 Hargett, the 35-year-old restaurant manager, decided to keep his day job despite having won the Million Dollar Shoot Out and decided to put a chunk of the money toward his childrens’ college funds. The Million Dollar Shoot-out makes a great fundraiser and is also a great contest to run just to offer your players a ‘little’ something extra (to the tune of $1,000,000!). Want to make someone one of our next Million Dollar Shootout winners? Need hole in one coverage? Give us a call at 800-827-2449 or email us for a free, no-obligation quote!